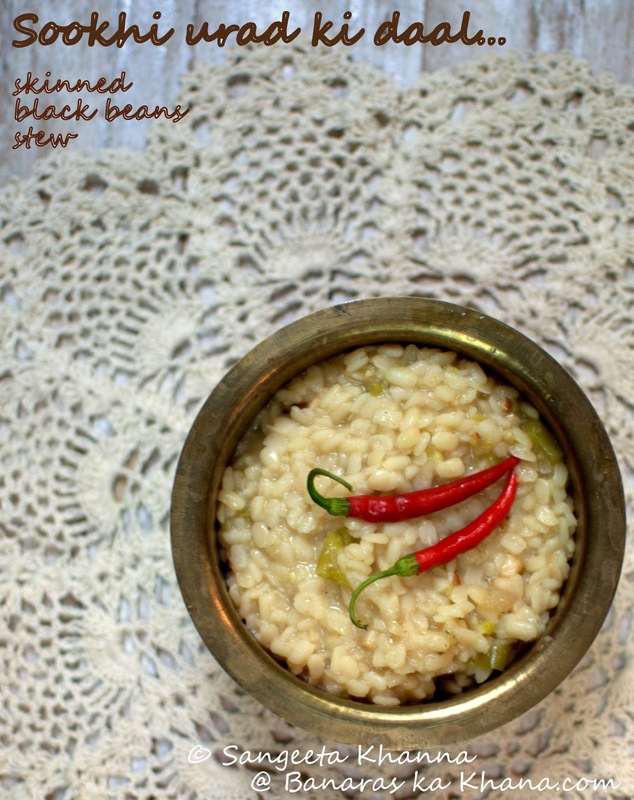 Sookhi urad ki daal is not the everyday daal in UP homes. The ubiquitous everyday daal in most UP homes is peeli daal or arhar ki daal or even a mix of masoor, mung and arhar daals (skinned mung beans, red lentils and pigeon peas) to make a yellow daal. Now even this yellow daal would be very different in each home with a favourite tadka, the consistency being thick or thin the way a particular family likes it. Urad daal (skinned black lentils) is not something people like eating everyday. But then there are days when they want a break with peeli daal and some special daal will be made, not necessarily an elaborate recipe or a rich preparation, but a change in the routine is seen as special. 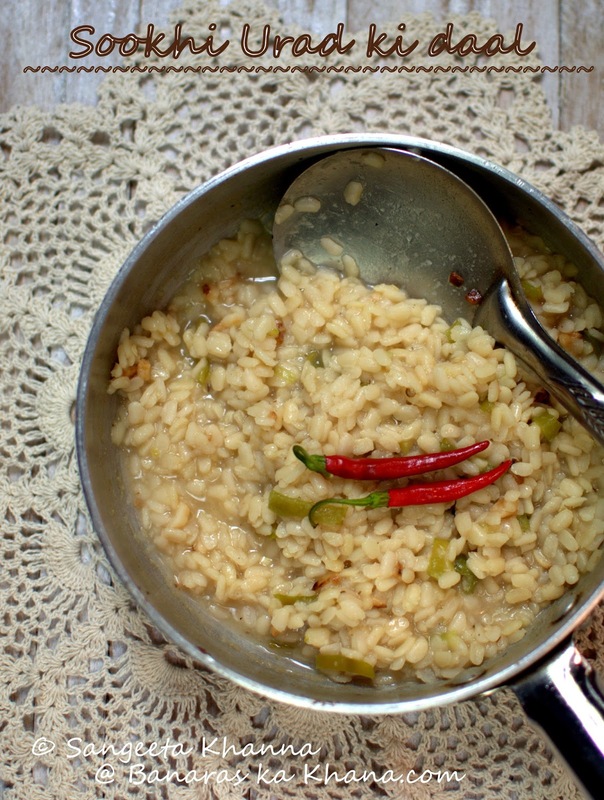 This sookhi urad ki daal is one of those daals and often finds a place on party menus too. I am talking about the days when 'daal makhni' was not the only popular daal preparation for vegetarian menus. This sooki urad ki daal also has various versions and home cooks keep innovating the tadka or the garnish but the cooking procedure of sookhi urad ki daal is considered a skill to be proud of. You might find people who criticize a sookhi daal in the way it looks. Whether each grain of the daal is clean or has got mushy or whether it is properly coated with ghee or not. Some people like each grain of daal coated with a red chilly infused ghee and some like loads of crisp fried garlic flakes interspersed with the daal. In older days it was rare to use tomatoes in this daal but now some people add fresh tomato paste to the daal, I find tomatoes spoiling the real fun of this daal. It is best cooked with minimal additives but the tadka could be as loaded as you like. Here is my simpler recipe that can be a base to start adding your kind of flavours to it if you wish. Or just enjoy the way I like it. This is the version I like with green chilies of the mild variety. You can use some hot green chillies and a little finely chopped green capsicum to get that effect if you wish. Purists would slow cook the daal in a pan over gas flame and would strain all the cooking liquid as soon as the daal is soft but not mushy. Use more water if doing so. I just add everything in a pressure cooker and cook for 10 minutes after the first whistle. I like to retain whatever little cooking liquid remains in the daal. To prepare the tadka heat the ghee in a shallow pan and tip in the hing and then the broken red chilly. Let the red chilly get almost burnt when you add the chopped garlic. Now let the garlic alos browned well and then add this chilly garlic infused and almost smoked tadka to the cooked daal. Cover for 5 minutes to let the flavours infuse. Serve hot as a side dish. I like this daal even at room temperature and it often becomes the daal for lunch box for the husband. This daal behaves very well with dhungar or smoking with the help of a piece of charcoal. If you want that kind of smoky flavour just place the charcoal over gas flame till it gets red, place a steel bowl inside the daal pot with little ghee and a red chilly in it. Place the red hot charcoal into this bowl and cover the lid, let the red chilly burn and the smoke infuse into the daal. In my recipe I just let the red chilly get charred into the tadka and get the desired effect. The burn red chilly is removed after it does it's work. The daal looks plain and white but packs a punch. Slightly hot with chillies but more flavours of the green chilly and garlic that makes this daal quite potent. You just cannot eat too much of this. Best enjoyed with ghee soaked rotis made of whole grain. I like this daal with jowar rotis the most, with some baingan bharta for company. Do not add any dhaniya patta for garnish. Never.